This red barn landscape is an original oil painting on board, the size is 9″ x 12″. This red barn landscape is a favorite of mine and is close to where I grew up in Northford, Connnecticut. The barn was owned by the Newton brothers and now their daughter takes care of the property. 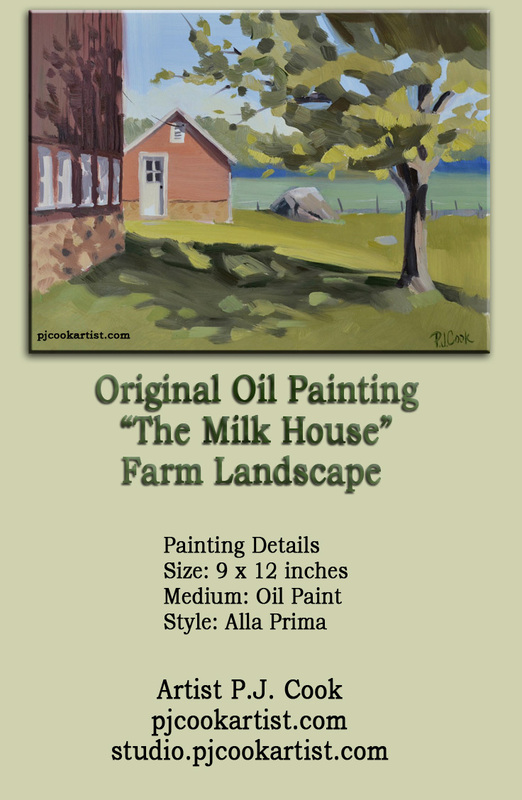 This small outbuilding featured in this painting is the milk house. Or where the milk tank is located on a dairy farm. The style of this painting is alla prima, completed in one sitting while the paint is still wet. They also call this style wet on wet and is painted in a direct, expressive style. You can see the larger brush strokes that were used throughout the painting. When the paint is still wet you can easily overwork areas and create muddy colors. So you must try to apply accurate brush strokes and then leave it alone.